Quickly transport office mail and small package delivery throughout your office and warehouse. 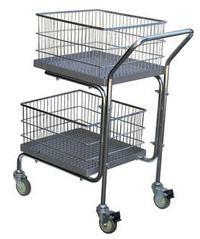 Two removable, lift-out baskets make delivery, collection, and filing of materials easy and convenient. Comes with two file folder hanger runners (Pic. 3 & 4) that can be adjusted for letter or legal size hanging files. 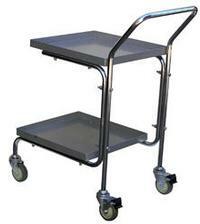 Excellent mobility on (4) 4" x 1/2" swivel casters with rear brakes. Steel construction. Easy assembly.